After a week away our world came crashing back to earth quickly. My friends the snakes have moved in while we’ve been away. Once chose to make it’s home under the swimming pool tarps while the second one chose to greet me at the back door when I went to go outside, sliding between the metal and the mesh. It was not a happy welcome home. I have resolved to invest in some ‘snake sticks’, which I have been unable to purchase in town as the only shop that stocks them is sold out. So they will have to wait til I am in the next biggest town for work next week. I have heard a lot about these ‘snake sticks’, some people think they definitely work, others think they don’t. Effectively they’re solar powered and they send out intermittent pulses at a frequency that deters the snakes to a 10m2 radius, apparently the snakes don’t come within that radius. At this point I am willing to give anything a go. My other purchase has been some Guinea Fowl. These birds are excellent at alerting you to snakes, they flap and squawk and surround the snake, giving you a chance to get the kids safely inside and try and find a way to deal with it. 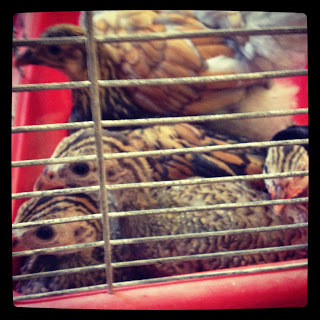 They are only little, but I have placed a lot of pressure on these birds to do the job they’ve been purchased for! It helps that they’re very cute and get even cuter as they grow. And just because I couldn’t resist we have a new rooster, we’ve called him Bobby, he’s a blue crossed with gold Wyandotte and looks like he’ll be a good looking bloke. This entry was posted in Farm, Mother Angst on February 19, 2013 by nat. Your post is perfectly timed! I have just cut out an ad for the “snake sticks” to show to my husband when he gets home. I am a bit skeptical so I will be very keen to ask you how you find them. and we have been told by several people re the guinea fowl too, Waiting to find out a bit more about how to keep them, are they difficult in any way and do they actually keep the snakes away/help with the snake situation etc so I will be waiting to hear what you think of them as well and will v likely be back to bug you with questions about both of these snake deterrents. We have just moved to an acre block and not keen on snakes and kids/cat/chooks/eggs etc. I heard about these snake sticks a few weeks back from a friend who is swearing that they work. Anything is worth a try to keep them away.